Whether it’s a big test or a first day on a new job, a good-luck message is always welcome and appreciated. 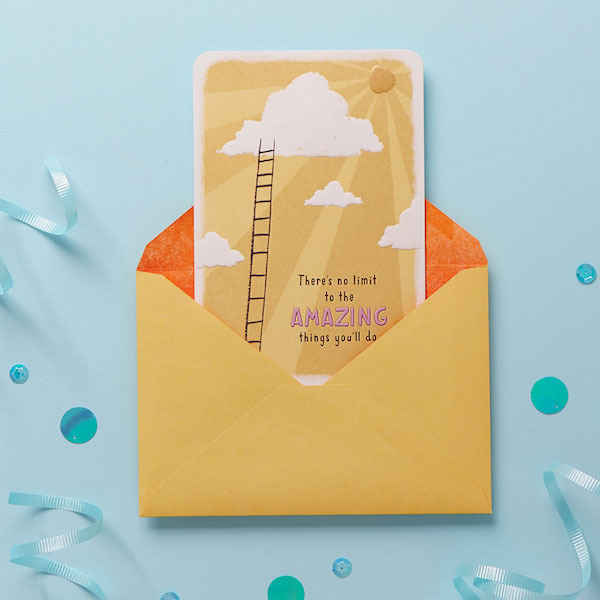 Your card might be just the confidence-booster a friend or loved one needs to get through a tough day or an important challenge! “Good luck”—those two little words can express big caring and encouragement all by themselves. But if you’d like to say more, you’ve come to the right place for ideas. From different energy levels, to different situations and recipients, we’ve got tips and message starters to get your thoughts flowing and your pen moving. Whether you keep it low-key or amp up the enthusiasm, we hope our ideas help you send a little well-timed luck and support to someone who needs it! You don’t have to write a lot to encourage your recipient in a big way. It’s fine to keep your personal message short and sweet—especially when the card itself has already said quite a bit. “I know how important this is for you. Hope you know how much I’m pulling for you! Writing tip: Is it possible to overdo the enthusiasm in a good-luck message? If you’re writing to someone facing treatment for a serious illness or other difficult circumstance, then maybe so. But in general, don’t hold back on the energy…or the exclamation points! If you want to go one step beyond a simple good-luck wish, try expressing your belief in your recipient and their ability to tackle the challenge they’re about to face. Compliment them for preparing well. If appropriate, remind them of how far they’ve already come. Writing tip: What if the card itself has already said “good luck”? Build on it by sending “good thoughts,” “good vibes,” or “good wishes.” Express confidence. Add a compliment. Or simply remind your recipient that you’re thinking of them. For kids, good-luck messages should focus less on achieving any particular outcome, and more on things like doing their best, having fun, and knowing they’ve got a cheering section. Writing tip: A doodle, riddle, on knock-knock joke written off to the side can make a fun addition to a good-luck message for a child. “No bird soars too high, if he soars with his own wings.” —William Blake Looking forward to watching you soar! “I can do all things in him who strengthens me.”—Philippians 4:13 (RSV) You can do this! Good luck! “We find in life exactly what we put into it.” —Ralph Waldo Emerson Here’s to giving it all you’ve got! Writing tip: If you know your recipient admires a particular well-known person, past or present, see if you can find some inspiring words from that person. A warm closing before your signature is a perfect way to wrap up any good-luck message. Choose one of ours, or come up with one of your own.